I personally shoot on a Canon EOS 5D Mark IV, which is a fantastic all-round camera, but quite expensive if you aren’t working professionally. Previously I have used a Canon EOS 60D to similar effect – this camera is also easy to pick up on the cheap second-hand. I have a small arsenal of lenses for macro photography as well. When shooting in the field I use the Canon 100mm L series macro for the small stuff and the specialist Canon 65mm MPE for the tiny stuff. When shooting in my studio, I will use both above lenses as well as my two Nikon microscope objectives (4x and 10x) stuck onto the end of a big Canon 100-400mm lens. Lighting is critical and so I usually use 2-3 off-camera flashes with DIY diffusers, although this is not always necessary or practical when shooting in the field. You don’t need to be a pro, but make sure that you know the basics. In today’s digital era, it has never been easier to take some test shots and see how an image is turning out, so don’t be afraid of firing away and “chimping” (checking your LCD screen a lot) between shots to get comfortable with how the images are turning out. Make sure that the images aren’t too dark, aren’t too blurry and are in focus. Moving off auto-mode is very helpful and a great way to learn how photography works, but doing so too early can also overwhelm a photographer. Spotting bees can be difficult. But a sure-fire way to find them is to go where they go – flowers! Not all flowers attract bees, for example many garden varieties are introduced or are too modified and so might not provide food for bees. Native flowers such as melaleucas and gums are often hot-spots for native bees. When certain native plants are blowing up with bee activity in the warmer months it’s a great idea to put down your camera and spend some time watching how the bees behave, where they land on the flowers and what disturbs them. Practice knocking the flowers, or casting them in shadow to see what frightens them away. Once you have done this, not only will you know how to avoid scaring them, you will also have a better understanding of their behaviour. Photography is literally all about light. Camera sensors and film simply record the light that comes into your lens, mastering this light is how we fill our canvases. Shoot in the golden hour or under overcast skies to get interesting or soft light. Shoot with a bit of paper reflecting light back onto your subject and filling in the shadows. Find the light, learn how it changes an image and once you are confident learn to manipulate it before it gets into your camera and onto your sensor. Lighting is one of the ways that photographers can express their creativity and indeed transform an entire scene. 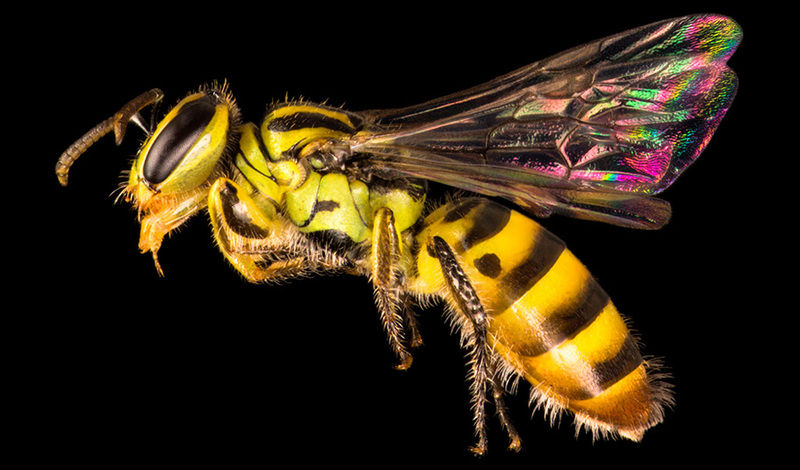 Depth of field is so limiting for macro photography, people have worked out a way around it. This powerful technique is called focus stacking and it can be extremely useful to the macro photographer. Multiple photos can be taken through a subject by either moving the camera or the focus, so that in a series of photos you get an entire subject in focus. These images can later be “stacked” together in post-processing using programs like Zeren Stacker, Helicon Focus and (somewhat clumsily) Adobe Photoshop. Focus stacking is also often used in landscape photography to get a whole scene in focus. But beware: your subject must be completely still or close to it, otherwise you will have trouble stacking the images together in post-processing. Online forums such as photomacrography.net are a great place to get started with focus stacking. Sure, becoming familiar with your camera and lighting will elevate your photography but don’t forget composition. In other words, where you place the objects, subjects and indeed everything and anything in your frame. This is one of the most difficult things to master but, like lighting, playing with composition allows a photographer to express their creativity and imagination. Creative possibilities aside, there are some simple rules that you can follow to improve your photography. The ‘rule of thirds’ is one of the easiest to adopt into your shooting style. By dividing your frame into thirds horizontally and vertically you create four points of interest where those lines intersect, this is where a viewer’s eye is drawn – whatever you want your viewer to look at, place in one of those spots. Another good rule is to leave more space on the side of the frame that your subject is looking at. This directs the viewer’s eye towards that empty space and lets them explore the image more deeply. My favourite bees to photograph are always those with brilliant colours, particularly those that you don’t come across all that often. 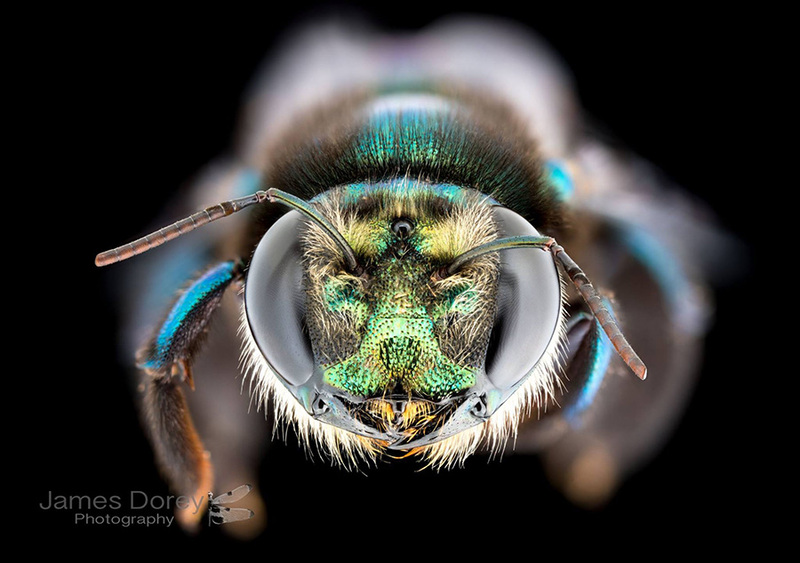 Neon cuckoo bees are certainly up there for their rich blue and black colouration as well as green carpenter bees for their large size and incredible metallic greens. Not far behind however, are the wonderfully diverse euryglossines that include small to medium sized yellow, green, orange, red and black bees. 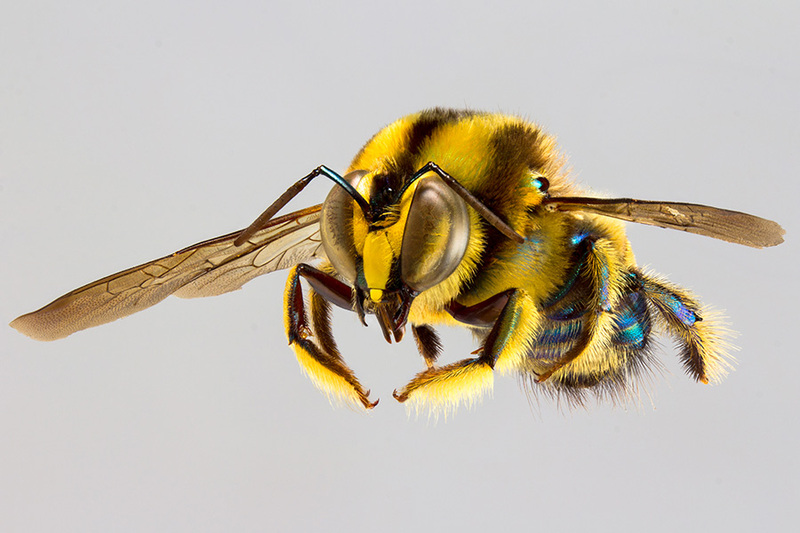 I have yet to find a bee that is not gorgeous – but I might be a little biased. 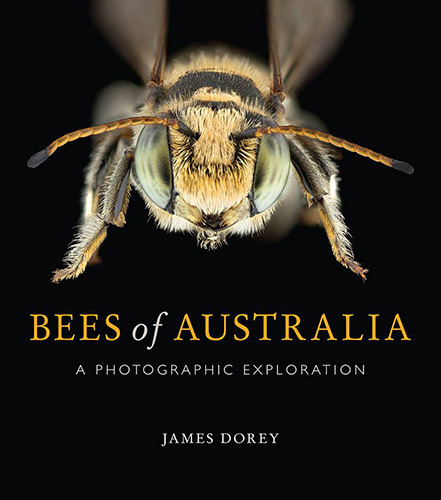 You can purchase a copy of Bees of Australia HERE.